Why don't you want to understand it ? Why ? How many times should I repeat it for you ? Please, answer me. 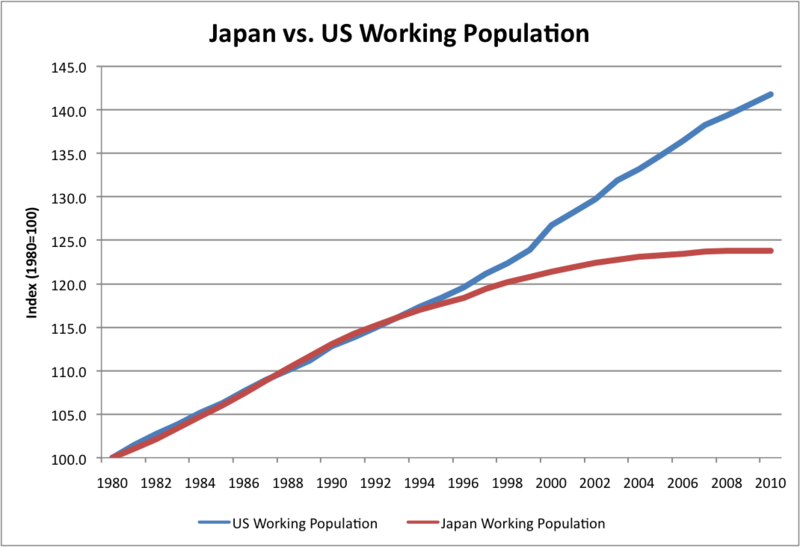 "From 1980-2009 (as far as this data set goes, unfortunately) Japanese GDP/capita has kept pace with the US. In fact, growth has actually exceeded that of the US over the whole period (US GDP per capita is still higher on an absolute basis though). This indicates that productivity has kept pace with the US even if aggregate GDP has not. Importantly, rising per capita GDP means that standards of living have risen, not fallen, which is the primary reason for economic activity: higher standards of living." (1) per capita GDP isn't the only metric: real GDP is just as important. (2) the data shows an average GDP growth rate from 1992–2003 of 0.87%: quite low. The growth rate of Japan's population must also have slowed before the actual population contraction some report, another factor influencing per capita GDP figures. (4) furthermore, if they taken steps to stop the lost decade from happening back in 1993/04, then per capita GD would have been even higher now than the figures you report. "Despite outpacing the US between 1980 and 1990, Japanese GDP has nearly flat-lined since. Most people know that a large part of the problem is demographic. The Japanese working-age population has similarly flat-lined over the same period, and the total population has actually begun to shrink." "How should one compare growth records among a group of similar developed countries? The best measure is not overall GDP growth, but the growth of income per head of the working-age population (not per capita). This last element is important because only the working-age population represents an economy’s productive potential. If two countries achieve the same growth in average WAP income, one should conclude that both have been equally efficient in using their potential, even if their overall GDP growth rates differ. When one looks at GDP compared with WAP figures (defined as the population aged 20 to 60), one gets a surprising result: Japan has actually done better than the US or most European countries over the last decade. The reason is simple: Japan’s overall growth rates have been quite low, but growth was achieved despite a rapidly shrinking working-age population." "While GDP growth has been weak, its productivity growth has been better than the average in the OECD." Isn't this the gist of what I just said? Demographic factors lie behind the per capita GDP figures. The actual real GDP data show very low growth 1992-2003, which reflects the economic malaise in these view, especially the deep recession 1999-1999 (which was the result of austerity). I think the point Meng Hu is making is that Japan's real GDP growth isn't as important as growth in GDP per capita. Which is completely correct: growth of GDP alone does not tell you much if you don't know what is going on with the underlying population. A fast GDP growth with an even faster growth in population is getting poorer over time. If Japan's population is falling and GDP is stagnant or even in recession - so long as it falls slower than population, the real GDP per capita is growing and Japan is, in a sense, becoming more prosperous.